Averaging 25Mbps, Jase’s is the fastest wi-fi of all the cafes we evaluated in Kuching (and make no mistake, Jase’s is as much a cafe as it is a tea house!). The cafe experienced a small rush around 1pm, but the guests were mostly working professionals from the iCom Square area. Not noisy, not much loitering. What we liked most was Jase’s large, open space, and comfortable chairs. They even have standing tables! The only real drawback to Jase’s Tea House is its location—it’s 2.8km from the downtown area. Unless you plan on working from iCube, that’s a 35-minute walk or MYR5-8 Uber/Grab ride (one way). Another potential drawback is that there aren’t that many outlets to plug in your computer. We arrived early and were able to find an outlet, but we only found two along the wall and none in the common area. Fortunately, this is relatively quiet cafe, and the wi-fi speed and consistency made a difference. Tips: arrive early to avoid the possibility of having to work without being able to plug in. The turf and decor of this cute cafe near CityONE Megamall made us feel like we were working in the house of a hipster grandma. The wi-fi is reliable and at 7.5MPBS, fast enough we could stream videos in good quality without buffering. It’s also fairly quiet. At 11am on the day we evaluated Coffee Clinic, there was only one other person in the cafe. The music played, we noted, is “soothing.” There’s a colorful seating area outside on top of turf, and bench seating is available inside. We counted three outlets for four tables along the main wall inside. There are restaurants and cafes nearby, but they’re mostly located in CityONE, which is almost 5km from the downtown area. The cafe also offers restaurant-quality food (sandwiches, cake). Tips: Plan to spend the day here if you come. Grab a late breakfast or lunch at Coffee Clinic, your next meal at CityONE, then head back to Coffee Clinic to finish the day. After hours, grab a beer at Cupella next door. Considering Kai Joo is an open-air cafe along a street, we found it surprisingly quiet. No complaints from us on the wi-fi or outlets, and the central location makes it an easy walk if you’re in the downtown area. Our complaints were limited to the music they played loudly overhead (which I’m sure they would have adjusted if we’d asked) and that there was no toilet paper in the bathroom. Good natural lighting, and despite being open-air Kai Joo does run an air conditioner. Bonus: they have board games! Pros: location, noise level, lighting, anonymity, board games! The biggest benefits to this cafe are its proximity to downtown and the “anonymity” the staff give their guests. It took us two minutes to walk from our guesthouse to Kopi-C, and it wasn’t uncommon for us to spend the entire day there. Our only real disappointment was the lack of outlets. The cafe installed a grand total of two! We also noticed that Kopi-C is equal parts cafe and restaurant, and seems to be a popular destination for special occasions (we witnessed several birthdays and Mother’s Day celebrations). The noise level picks up as the day progresses, which can make concentrating difficult. The upshot is you could start your day sipping a cup of coffee in the morning and end it with dinner and a beer! Bonus: this is one of Kuching’s historical buildlings and you can sense from the moment China House comes into view that the building has character. Can also take breaks in the China House court yard which has a green area with fountain, musical intrsuments, and a ping pong table! Tips: this is another good go-to cafe within walking distance. Just make sure you find a seat next to one of the two outlets! High ceiling, smart layout, crisp branding — TreeSixteen checks all the boxes for a cafe you’d expect to find in a major city with a passionate cafe culture. There’s a loft upstairs where we felt comfortable working from for hours, and there is no shortage of outlets. We never felt pressured to leave, and the drinks on the menu ranged from classic Americano to healthy green smoothies. Aside from its location (5km from downtown) our only real complaint was the slightly religious overtones. TreeSixteen is a Christian-run cafe, the name of the cafe itself a pun adapted from John 3:16, one of the Bible’s most famous passages. As far as we could tell there is no direct proselytzing at TreeSixteen, but Christianity seems to permate much of the cafe’s brand, from the pictures and quotes on its walls to its social media posts and the wi-fi password (it’s something like “316John316”). That didn’t bother us, but considering the religious diversity of Sarawak (44% Christian, 30% Muslim, 6% Buddhist, 7% Hindu) we felt it was worth mentioning. Tips: good place to head if you’re working and want a change of scenery from the downtown area. TreeSixteen probably isn’t ideal to work from for the entire day, but you could easily spend a few hours here at a time. 17% of score — wi-fi consistency: How steady and consistent is the wi-fi? Are we given a two-hour session before we’re cut off or can we access the internet consistently for as long as we need? Once using the internet, does the internet spike or cut out? In our heads, a cafe with flawless wi-fi is one that is session-less (not limited to one- or two-hour of access at a time) and whose speed doesn’t jump or cut out throughout the day. 15% of score — wi-fi speed: We measured wi-fi speed with Ookla’s app and desktop speed test. Higher speeds got higher scores. We took the average speed of multiple tests. 14% — Outlets: How easy is it to find an outlet? Cafes that scored highest on this criteria were the ones with a good outlet-to-seat ratio. 13% — Workability: Workability means all the factors that contribute towards a productive and enjoyable working experience. We limited the scope of workability to the physical space of the café — the ambiance of the café, comfort of seating, layout of tables, cleanliness of the bathrooms, friendliness of the staff, whether the cafe served food, etc. 11% — Location: How many kilometers is the cafe from the Hornbill Fountain? This is the fountain next to the Chinese History Museum (near the river). Our assumption is that digital nomads would be staying in the downtown area of Kuching. We picked the Hornbill Fountain for its (roughly) central location between Chinatown and Carpenter Street. 10% — Anonymity: Did we feel pressure from the cafe to order another cup of coffee after a certain amount of time? Did we feel from the staff that working from this location was not appropriate? Did we feel obligated to leave after a period of time? The cafes that scored highest on this criterion were the ones that made us feel “anonymous,” able to work without being noticed. 9% — Hours of operation: The longer the hours of operation in the day, the higher the score. 6% — Workplace volume: Can we hear ourselves think? Quieter cafes scored higher on this variable. 5% — Cappuccino price: Cheaper cappuccinos scored higher. The most expensive cappuccino was MYR12.5 at Earthlings Coffee Workshop (and HQ). The cheapest was MYR8 at Lima.Tujoh and Coffee Obsession. Indah Café — didn’t score because Indah does not have wi-fi. Rusty Bean & Batter — didn’t score because we didn’t think this cafe was a suitable place to work. The cafe has a walkway running straight through it that leads to a highway overpass! FoamWorks Café — didn’t score because the cafe’s wi-fi was down. If they fix their wi-fi, it could be a good place to work from. The Library Coffee — this is more of a restaurant than a cafe to work from. Black Bean Coffee — didn’t score because Black Bean isn’t a suitable place to work. No outlets, loud and busy atmosphere, small space, etc. The Container Café — didn’t score because Container is more of a restaurant than a cafe. Jing-Si Books & Café — didn’t rank because Caitlyn said they don’t have wi-fi. Sanjuro Café and Art Space — didn’t score because Sanjuro is more a bar/restaurant than workplace cafe. The main thing to note about this list is it assumes the audience for your post is digital nomads. After ranking the cafes on a number of factors, we weighted the what we think are most important to digital nomads (like the distance from the center of downtown, workability, and anonymity). Luci and I discussed them extensively and agree that these five cafes belong in the top five if you’re evaluating them as a place to work. Also, a list like this doesn’t exist for Kuching yet. 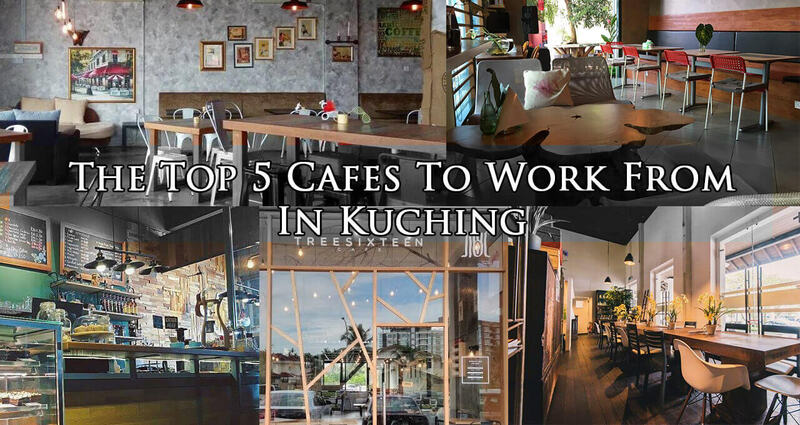 We looked extensively before choosing to work from Kuching. The closest we got was this TallyPress post. But his angle was “hipster” cafes which aren’t exactly the best places from which to work. If we were aiming to evaluate this post for what Kuching-ites want from a cafe, the weightings we used for each variable would probably be different. I’d be curious to know what your viewers think of these rankings!